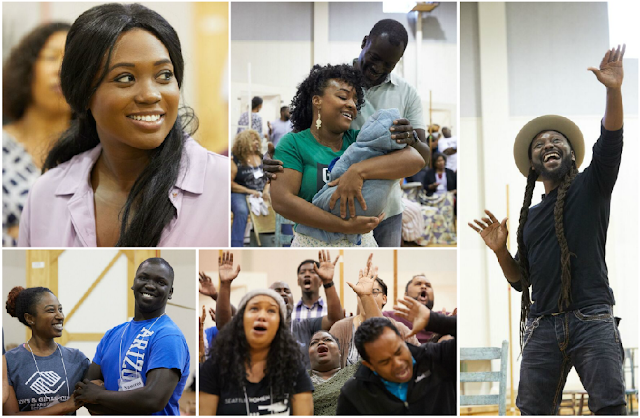 Rehearsal photos of Seattle Opera's Porgy and Bess by Philip Newton. 5:45-7:15 p.m. or 7:30-9:30 p.m.
Seattle Opera invites Black youth ages 10-20 to come experience the magic of opera up-close during a rehearsal for Porgy and Bess (free event). With iconic melodies such as “Summertime,” and featuring an all-Black cast of local and international artists, the Gershwins’ American classic makes the perfect introduction to opera. Attendees 13 and younger must be accompanied by a parent or guardian. Seattle Opera Studios are located at 200 Terry Avenue North, Seattle. Please enter from the north end of this building, at the corner of Terry Ave N and Thomas Street. Spots are limited and require RSVP. To secure a spot, email courtney.clark@seattleopera.org with the following information: name, age, school you attend, number of people in your party, and which timeslot you’d like to sign up for (either 5:45-7:15 p.m. or 7:30-9:30 p.m.). Additionally, attendees must sign a hold harmless form, which can be found here, and returned via email or in-person at the event. While our new civic home is being constructed at Seattle Center, our current studios unfortunately present accessibility challenges. For participants with disabilities, please let us know how we can best accommodate you. Additionally, please read our content advisory here.